Accommodates most of the 35"-65" plasma, LCD/LED TV or not exceeding 150 lbs. 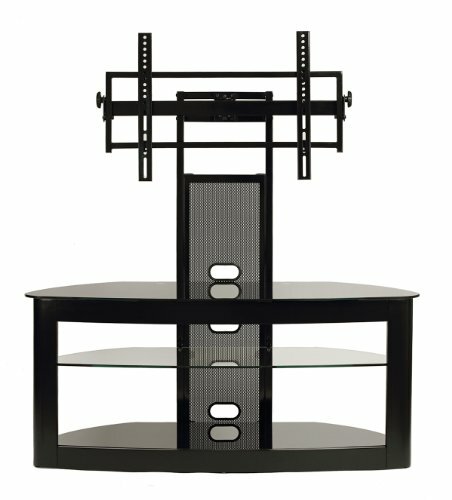 ; Adjustable flat panel TV universal mounting system with 12° tilt up or down and 15° pivot left or right; Constructed with engineered hardwood frame and heavy gauge powder-coated scratch resistant steel in black finish; Curved front tempered safety glass top and bottom shelves with high gloss black finish; Adjustable clear tempered glass middle shelf is removable for extra tall audio video components; Cable management system to hide wires & cables; holds at least 4 audio video components and a center channel speaker; Contemporary design compliments any room decor; Easy to assemble. Overall Dimensions: 50.2" W x 22" D x 56.3" Usable shelves space: Top shelf : 30" W x 19" Adjustable middle shelf: 30" W x 18" D x 7" Bottom shelf: 30" W x 19" D x 8.5" H.
Accommodates most of the 35"-65" plasma, LCD/LED TV or not exceeding 150 lbs.